Journalist Tracie McMillan talks about how the poor, including those who work in the food system, are treated by that system. 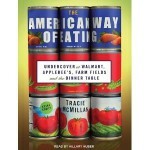 Her book is THE AMERICAN WAY OF EATING: Undercover at Walmart, Applebee�s, Farm Fields and the Dinner Table. 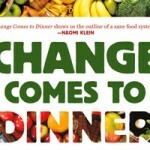 Also Katherine Gustafson tells us about CHANGE COMES TO DINNER: How Vertical Farmers, Urban Growers, and Other Innovators Are Revolutionizing How America Eats. Got food? Millions of Americans won�t, if Paul Ryan gets his way with the food stamp program. The program, called SNAP, helps 46 million Americans afford to eat. That�s about 1 in 7. But it�s under threat. Under Paul Ryan�s plan — and the plan of the House Agriculture Committee, 2 to 3 million Americans would be thrown off the program. 280,000 kids would become ineligible for free school lunches and many seniors dependent on Meals on Wheels would find their major source of food security gone.�Ryan defended the cuts, saying �we think you have to get savings in some of these areas where you�ve had a huge increase in spending.� That ignores the reason the food stamp rolls have nearly doubled: the economic collapse that occurred under the last Republican administration. But you don�t have to have lost your job in the recession to need food stamps. Millions of working people are poor enough to need them. And if you work in the food industry — on a farm, warehouse, grocery or restaurant — you�re even more likely to earn too little to afford a healthy diet. Journalist Tracie McMillan set out to report the story of these workers and what their plight says about the American way of eating. She reported the old-fashioned way: she went undercover to work in the baking hot fields of the central valley in California, at two Walmarts and at an Applebee’s in New York.�The result is her acclaimed book, THE AMERICAN WAY OF EATING — a book so powerful, it riled up Rush Limbaugh for its advocacy of food justice. 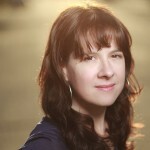 McMillan has won several national awards for her journalism, including the Harry Chapin Media Award and the James Aronson Award for Social Justice Journalism. She is a Senior Fellow at Brandeis University’s Schuster Institute for Investigative Journalism. The American Way of Eating is her first book. It was published by Scribner in February. The globalized industrial food system is getting hammered by climate change. Two thirds of the U.S. is now in severe drought, slashing yields in the corn and soybean fields of America�s breadbasket by up to a third.�It�s just going to get worse, according to recent studies. We�re going to need to bring resilience to our food supply — and many think the key is to grow more of our food locally. 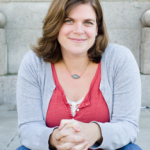 Gustafson is an award-winning writer, journalist, and editor whose articles, essays, and stories have been published in, among others, The Christian Science Monitor, Slate, and The Best Women�s Travel Writing. She writes about sustainable food for such venues as Yes! Magazine, The Huffington Post, and Change.org.